Born in Bobruisk, Belarus, USSR, Eduard Alexeyevich Belagurov was a Soviet painter, member of the USSR Union of Artists (1977). In 1974 he graduated from the department of monumental and decorative painting of the Belarusian State Theater and Art Institute. Currently, his works are in the National Art Museum of Belarus, Museum of Modern Art in Minsk, the funds of the Belarusian Union of Artists and the Ministry of Culture of Russia. The artist has participated in the exhibitions of Soviet Art since 1975, awarded a diploma of the USSR Academy of Arts (1980). Meanwhile, already in the early works Eduard Belagurov manifested his civic position and the desire to raise actual problems of history and modernity in his art. He worked in easel painting in genres of figurative paintings and portraits. Among his major works: “Autumn cross” (1975), “Early Spring” (1976), “Conversation” (1982), “Dialogue” (1982), “Children of War”, “The Return”, “Surgeons. Operation” (the above image), and others. 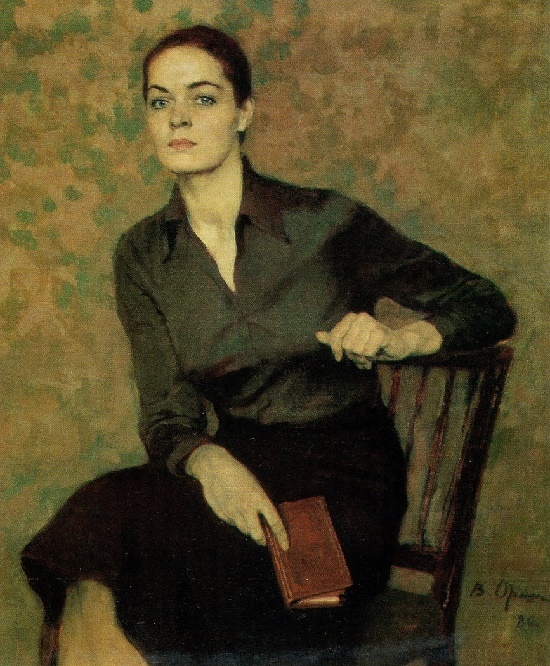 Born 20 January 1904 in Perm, Viktor Mikhailovich Oreshnikov – Soviet painter, teacher, and master of portrait. Candidate of Art History (1937), Corresponding member of the Academy of Arts of the USSR (1947) and Doctor of Art History (1948). Besides, he was the winner of the Stalin Prize of the third degree (1948) for the painting “VI Lenin at the exam at the Petersburg University” (1947). 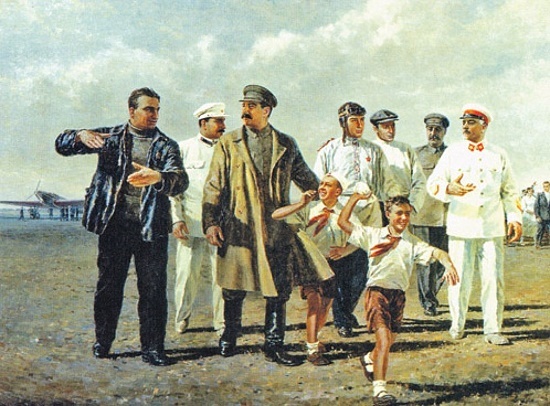 In addition, the winner of the Stalin Prize of the third degree (1950) for the painting “At the headquarters of the defense of Petrograd” (1949). Academician of the Academy of Arts of the USSR (1954) and People’s Artist of the USSR (1969). First, Oreshnikov received an art education in the Perm Art College (1924). Next, in 1927 he graduated from the Leningrad Higher Art and Technical Institute, and Academy of Arts (1933-1936). Noteworthy, his teachers were prominent Soviet masters Konstantin Petrov-Vodkin and I. I. Brodsky. Born 19 April 1900, Ekaterina Sergeevna Zernova (Simferopol) – Member of the Moscow Union of Soviet Artists (1932), book illustrator, poster and monumental artist. Daughter of the curator of the Natural History Museum of the Tavrichesky provincial zemstvo. When she was 14 years old, the family moved to Moscow. There she studied in private studio of F.Rerberg (1915-1918). Later, she studied at the State Free Art Studios – Vhutemas (1919-1924). First, it was the workshop of I. Mashkov, and then A. Shevchenko and D. Shterenberg. Meanwhile, alongside with artistic education she studied at the Physics and Mathematics Faculty of Moscow University (1917-1924). 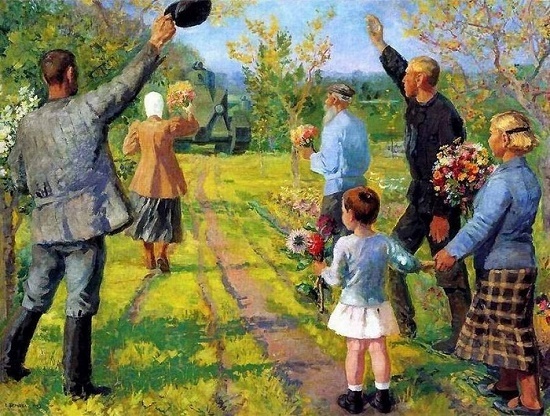 Born 17 December 1907 in Mariupol of Ekaterinoslav province, Pyotr Tarasovich Maltsev was a many awarded Soviet artist working in the genre of socialist realism. A member of the USSR Union of Artists (1932), Honored Artist of the RSFSR (1958) and People’s Artist of the RSFSR (1968). Pyotr Maltsev graduated from the Zaporozhie Art School (1921-1924), workshop of V.N. Nevsky. After that, studied at the monumental department of the fine art faculty of VKhUTEIN (1924-1930). His teachers were famous Soviet artists P.V. Kuznetsov, V.A. Favorsky, L.A. Bruni, and N.M. Chernyshev. 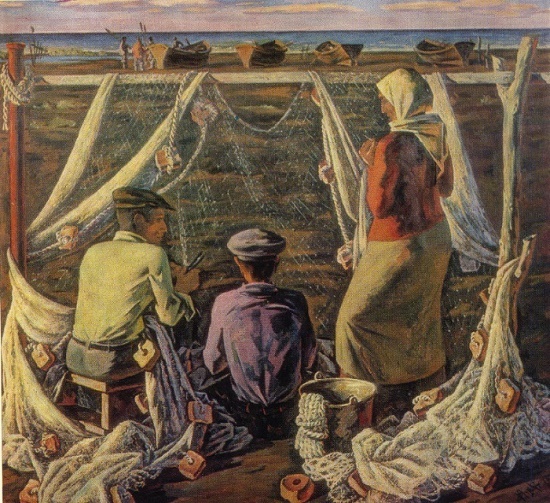 While still a student, Maltsev began participating in the exhibitions of Soviet art (1928). During the Great Patriotic War Maltsev served as an artist of the cultural enlightenment department of the Northern Fleet. Awarded with the Order of the Red Star and medals. In 1949 he joined the Studio of Military Artists of M.B.Grekov. Awarded with the first degree diploma and the gold medal of the USSR Academy of Arts (1960) for creating the diorama “Sturm of Sapun-mountain” (1959). Also, he received the gold medal of M.B.Grekov (1968) for participation in the reconstruction of the panorama of F.Rubo “The Battle of Borodino” (1967). This post features creativity of three Soviet Tajik artists, members of the Union of Artists of the USSR. In particular, Ilya Rakhnaev (1934-2003), Sukhrob Kerbanov (1946-2016) and Abdurakhmon Rakhimov (1933-2000). 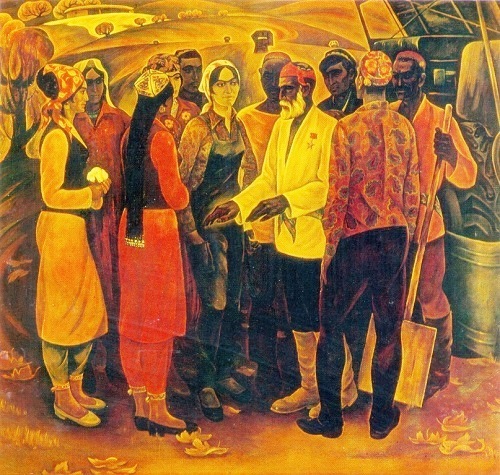 The author of the above painting – Ilya Rakhnaev, a member of the Union of Artists of the USSR, the main artist of Dushanbe, and the head artist at the Art Fund of Tajikistan. Born in 1934 in Tashkent, he successfully graduated from the theatrical art institute and began his creative career in the art fund of Tajikistan. The thirst for knowledge, the desire to see the world and depict what he saw in his paintings, prompted the artist to travel a lot. He creates a series of drawings and sketches depicting the life of the peoples of Central Asia, towns and villages, fortresses and historical monuments. Also, colorful portraits of Uzbeks, Tajiks, Kazakhs, Kirghiz, Gypsies, Jews and other representatives of the East. Ilya Rakhnaev died suddenly in 2003 in Austria, and buried in the Jewish cemetery in Vienna. Born in 1943 in Baku, Faik Agayev very early realized that he wanted to devote his life to painting. First, he studied at the Azim Azimzade Art College, and then moved to the capital of the USSR, Moscow. He entered the famous Surikov Institute, which at that time was considered to the most important and best art university in the USSR. It was at that time that he first presented his works for public viewing in the framework of the “Exhibition of Young Artists”. However, in the mid-90s, after the collapse of the USSR, he, like many of his colleagues, moved to Turkey, because he couldn’t earn much on his art those times. Thus, since 1996 F. Agayev lives in Bursa and teaches painting at Uludag University. The Soviet state propagated the development of national art and encouraged the revival of various forms of national decorative creativity. Noteworthy, the officials freed the Islamic regions from the religious ban on realistic art. 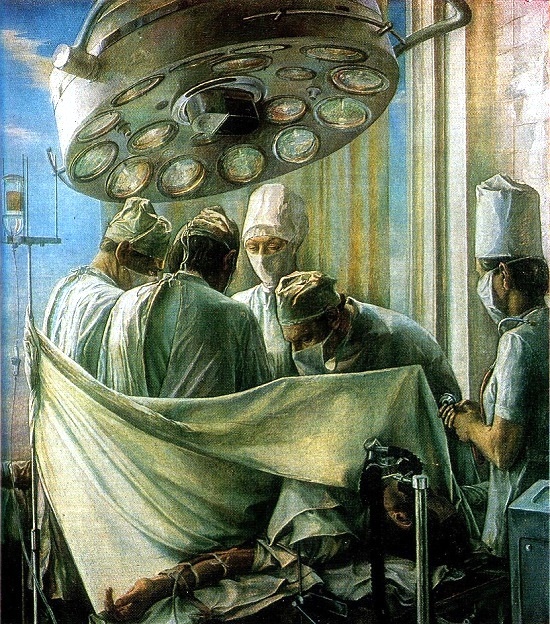 This post features paintings of the various Soviet artists, and the above picture, in particular, belongs to Fedor Vasilyevich Savostyanov (December 23, 1924 – April 2, 2012). 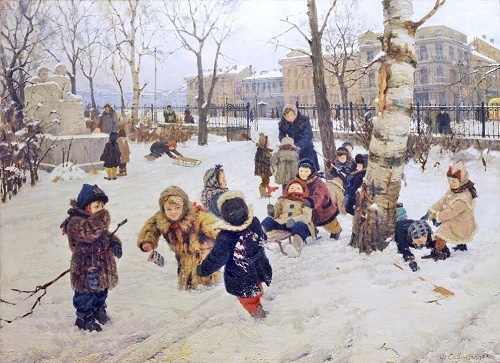 He was a Russian Soviet painter, Honored Artist of the Russian Federation, and member of the the Leningrad organization of the Union of Artists of the RSFSR. Born 23 December 1924 in the Bryansk region, he studied at the Odessa Art College. At the age of 17 he volunteered for the front. He fought at Stalingrad, Southern, 4th Ukrainian and 2nd Ukrainian fronts. Wounded three times, he received the Order of the Patriotic War of the 2nd degree, medals “For Courage”, “For the Taking of Budapest”, and “For Victory over Germany”. After demobilization he entered the Leningrad Institute of Painting, Sculpture and Architecture of I. Repin. He studied in the workshops of Leonid Ovsyannikov, Boris Vogel, Alexander Zaitsev and Boris Ioganson. Participated in exhibitions since 1954. Mainly he painted portraits, landscapes, genre and battle paintings. The works of Fyodor Vasilyevich Savostyanov are in the Russian Museum, the Tretyakov Gallery, in museums and private collections in Russia, Japan, Spain, Ukraine, France and other countries.